Txas area regulated on account of this insect, permit requirements covering the interstate movement therefrom of regulated citrus fruits have been ordered resumed on February 9, 1948. 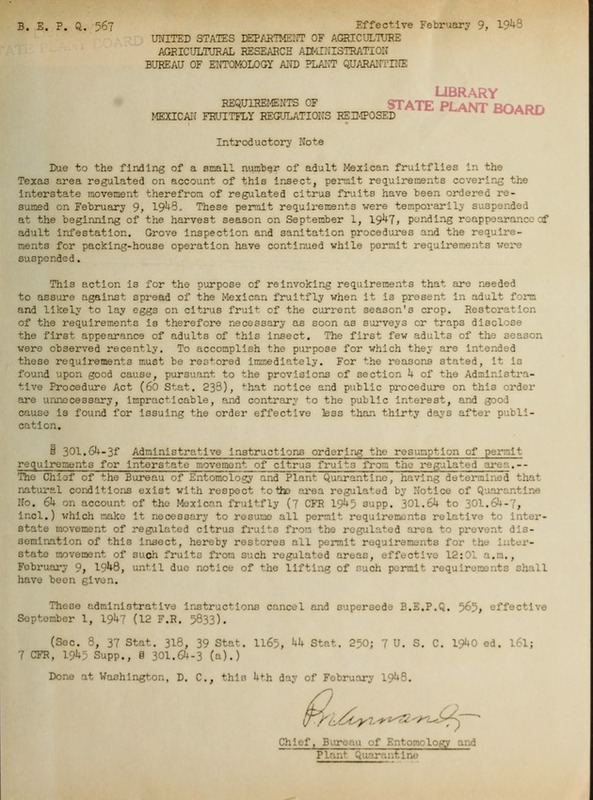 These permit requirements were temporarily suspended at the beginning of the harvest season on September 1, 1947, pending reappearancecf alt Infestation. Grove inspection and sanitation procedures and the requirements for packing-house operation have continued while permit requirements were suspended. to assure against spread of the Mexican fruitfly when it is present in adult form and likely to lay eggs on citrus fruit of the current season's crop. Restoration of the requirements is therefore necessary as soon as surveys or traps disclose the first appearance of adults of this insect. The first few adults of the season were observed recently. To accomplish the purpose for which they are intended these requirements must be restored immediately. For the reasons stated, it is found upon good cause, pursuant to the provisions of section 4 of the Administrative Procedure Act (60 Stat. 238), that notice and public procedure on this order are necessary, impracticable, and contrary to the public interest, and good cae is found for issuing the order effective bess than thirty days after publication. 301.64-3f Administrative instructions ordering the resumption of permit uirements for interstate movement of citrus fruits from the regulated area.-The Chief of the Bureau of Entomology and Plant Quarantine, having determined that natural conditions exist with respect toth area regulated by Notice of Quarantine No 64 on account of the Mexican fruitfly (7 CFR 1945 supp. 301.64 to 301.64-7, incl.) which make it necessary to resume all permit requirements relative to intertate movent of regulated citrus fruits from the regulated area to prevent dissemination of this insect, hereby restores all permit requirements for the laturtate movement of such fruits from such regulated areas, effective 12:01 a.m., February 9, 19148, until due notice of the lifting of such permit requirements shall have been given. These administrative instructions cancel and supersede B.E.P.Q. 565, effective september 1, 1947 (12 F.R. 5833). Done at Washington, D. C., this 4th day of February 1948.